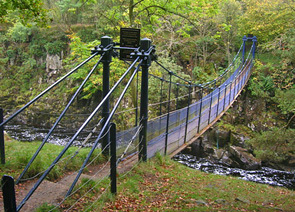 of the chain suspension bridge in Britain, supplying the iron that made new kinds of structures possible. Explore the story though the pioneering work of retired Naval captain, Sir Samuel Brown. A suspension bridge as we understand it today consists of a loadbearing horizontal deck suspended from continuous catenary cables running the full width of a bridge's span, usually supported on pylons or piers of some sort. Most modern bridges of this type feature vertical hangars connecting the cable to the deck at regular intervals. A good example in Wales is the Severn Road Bridge (1965). The historical development of suspension bridges can be traced back to ancient rope bridges, such as those traditionally used in the mountainous districts of India and central Asia. Strips of hide or vegetable fibres were used to make a flexible rope. A person wishing to cross was suspended from a wooden saddle that slid along the rope, hauled across by others. Variations of this form of bridge have been recorded elsewhere in the world, including South America, where the Tarabita bridge was traditionally used in a similar way. The use of iron cables in place of rope was first introduced by the Chinese. In Britain, various 'hanging bridges', such as the wrought iron Winch (Wynch) footbridge on the River Tees near Middleton-in-Tees, originally erected in 1741, also pre-date the development of modern suspension bridges. However, it's North America we need to look to next. The pioneer of the modern suspension bridge was Irish-born judge and inventor, James Finley (1756-1828). In 1801, he constructed a 21.34m wrought iron suspension bridge with a level deck across a creek south of Mount Pleasant in Pennsylvania, USA — Jacob's Creek Bridge (demolished 1833). By 1810, eight bridges of this type had been erected by Finley or his agent John Templeman. "The Chain Bridge lately thrown over the Merrimack, three miles above Newburyport, in the state of Massachusetts, is now in constant use. This Bridge consists of a single arc, two hundred and forty-four feet span. The abutments are of stone, forty-seven feet long, and thirty-seven high; the uprights, or framed work, which stand on the abutments, are thirty-five feet high, over which are suspended ten distinct chains, the ends of which on both sides of the river are buried deep in pits and secured by large stones: each chain is five hundred and sixteen feet long; and, where they pass over the uprights, they are treble, and made in short links, which is said to be more secure than saddles made of plates of iron. The four middle joists rest on the chains; all the rest are suspended to the main chains to equalize the floor. This Bridge has two passage-ways of fifteen feet in width each, and the floor is so solid as to admit of horses, carriages, etc. to travel at any speed, with very little perceptible motion of the floors." Newburyport is often put forward as the world's oldest surviving suspension bridge. However, its original chain cables, hangers and deck were replaced by 1909 when the present wire cable suspension bridge was built using reinforced concrete towers that are similar to the original in style. Captain Brown and his Welsh chain-making company Brown Lenox & Co would play vital part in the development of chain bridge design in the UK. Brown erected a test bridge in 1813, and went on to construct the country's first wrought iron cable chain suspension bridge, Union Bridge (1820), now the world's oldest surviving bridge of its type. Telford's spectacular Menai Suspension Bridge opened in Wales six years later. European engineers were paying attention to this new form of bridge too. Some ten years after the construction of Finley's bridge at Newburyport, French engineer Claude-Louis Navier (1735-1836) visited Brown and Telford in the UK to study their respective designs. Another French engineer (and suspected industrial spy), Joseph-Michel Dutens (1765-1848), published the results of his observations in Britain in an account in French of 1819. 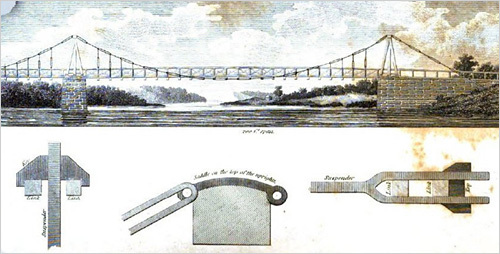 It includes an illustration of Brown's experimental bridge of 1813. Dutens' illustration also shows another somewhat different chain bridge — a bridge with a level deck resting on catenary chains supported on timber uprights, spanning the River Dee near Llangollen, in Wales. This was the original Llantisilio Chain Bridge (1818, rebuilt c.1876) designed by Exuperius Pickering (c.1781-1835), gentleman and ironmaster of Ruabon, Wrexham, Wales. Permission to erect a bridge had been granted in 1814 and so between that date and 1819, when it was seen by Dutens, the bridge was open for Pickering to deliver coal, lime and bar iron to the Corwen and Bala districts. Although an unorthodox design, it could accommodate road traffic and was therefore a great advance. Although the present bridge at the site is the third one constructed and bears little resemblance to Pickering's bridge, it is thought that its chains are the originals, and so the current footbridge is supported by the world's oldest iron chain cable links still in use. 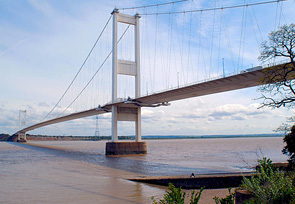 It is perhaps unsurprising that many early developments in the use of iron for bridges — suspension bridges and non-suspension alike — are linked to Wales. As the end of the 18th century drew to a close, the Industrial Revolution transformed Britain's industries, and mining and ironworking boomed in Wales, particularly in South Wales. Engineers now had access to iron of consistent quality, and ironmasters were looking for ways to use their products. Next we focus more closely on the work of Brown and Telford. An example of a modern suspension bridge — Severn Road Bridge (1966), designed by Freeman Fox & Partners and Mott Hay & Anderson. It links England and Wales across the Severn estuary. In the foreground is the old ferry slipway, constructed by Henry Habberley Price (1794-1839, associated with Brown's Beachley Bridge proposal of 1825). A British predecessor of the modern suspension bridge — Winch (Wynch) Footbridge on the River Tees. The original was erected in 1741 and featured hand-forged wrought iron cables (or chains). In 1802 a chain broke and the bridge collapsed. The present bridge is an 1830 replacement. The chain supports (trestles) are of wrought iron and the 'hanging' deck is of timber. Falls of Schuylkill Bridge (1808), Philadelphia, Pensylvania, USA, designed by James Finley. Finley's groundbreaking Jacob's Creek Bridge (1801) was of similar design but only one span.